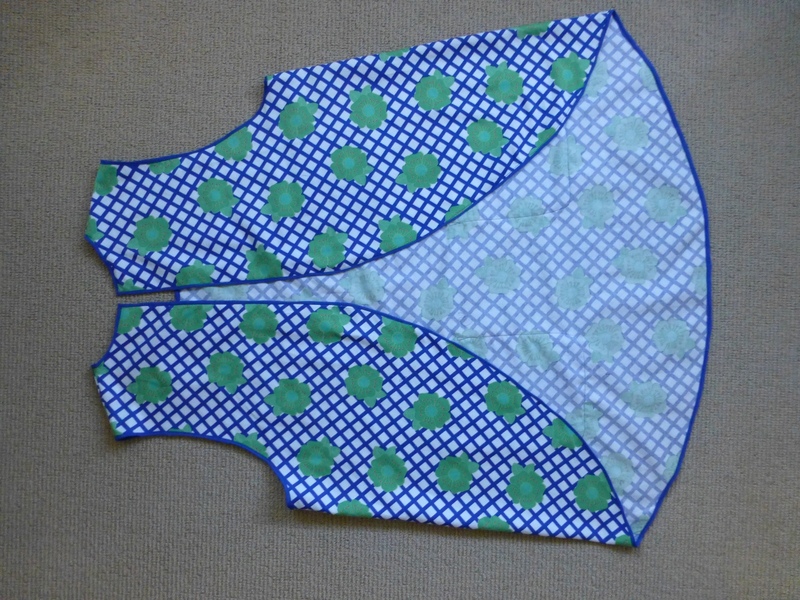 My latest apron is a traditional Scandinavian design, using a different pattern from Kwik Sew 2191. 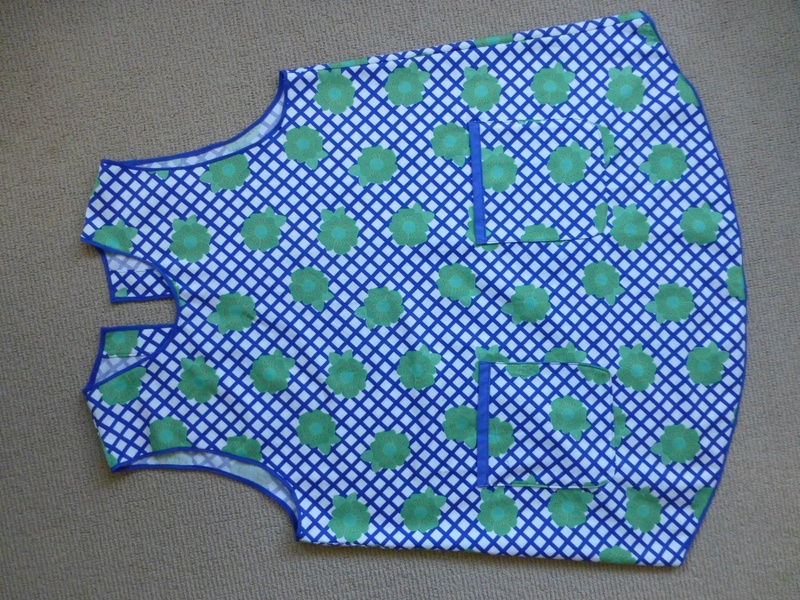 You may recall that I made a workshop apron recently, also using Kwik Sew 2191. 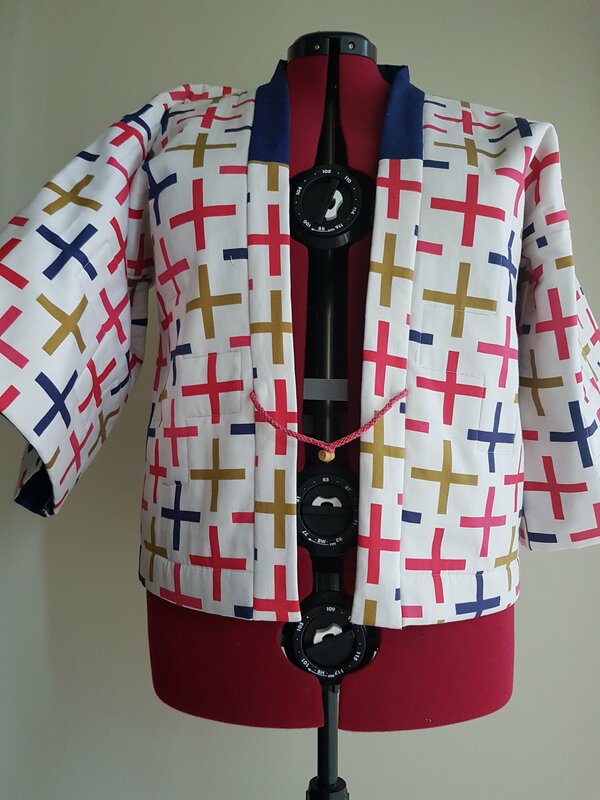 I modified the pattern just a little as I wasn’t crazy about the single button closure on the back and the need to add reinforcing under that single button. Instead I made a self-faced button band with interfacing. I also extended the centre back to give a little more coverage. 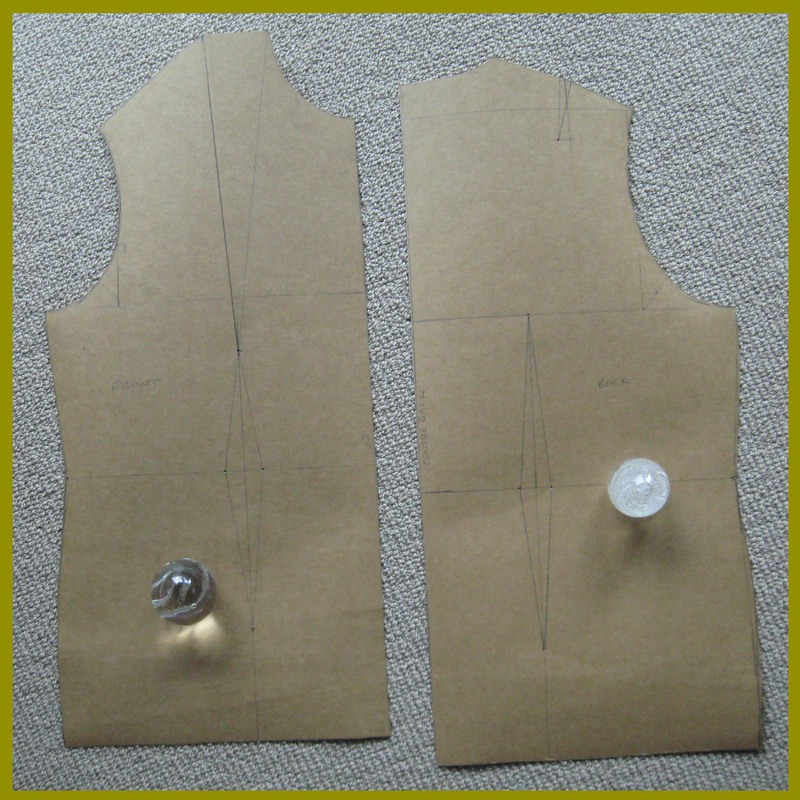 This modification will allow two buttons to keep the apron in place. I’m happy with the result but the bias binding was a real pain to attach. This project reminded me why I often avoid patterns that call for raw edges to be finished with bias binding. It’s often more trouble than it’s worth, especially when the binding is narrow, as it was in this case. This pattern required a lot of bias binding, too. I ended up using every last millimeter of the 5m of binding in the packet, and had to do some heroic zigzagging to make ends meet on the last arm hole. I love this fabric. It’s a retro drill from Spotlight. 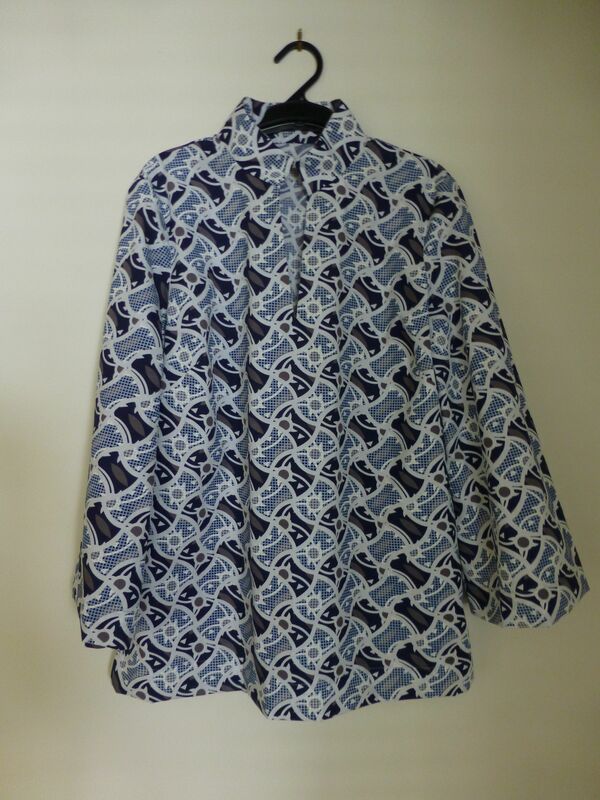 If you decide to make this pattern be aware it’s quite generously sized. I made the large size and it’s very roomy. Knowing what I know now, I don’t anticipate I would ever make anything other than the small size. 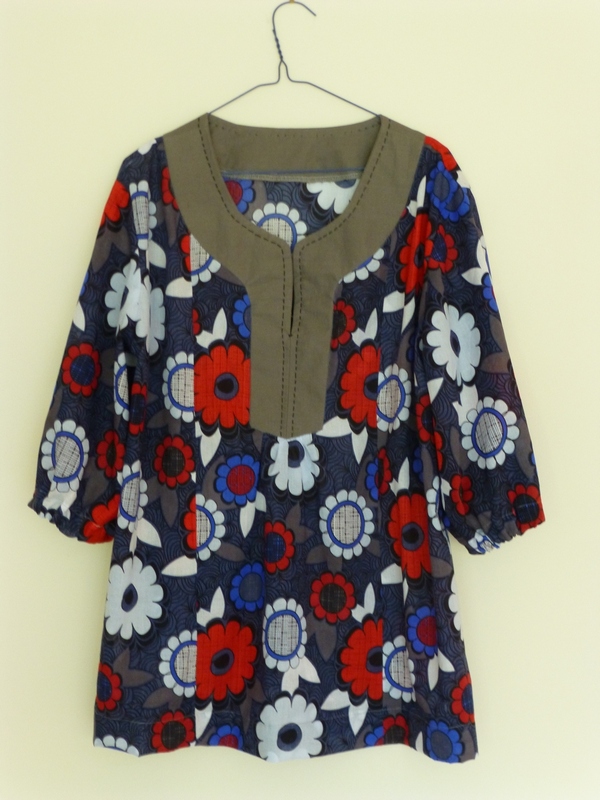 After my recent experiences, I’m beginning to have serious doubts about commercial dress pattern grading these days. Maybe I’m just having a bad run. Or maybe no-one’s double checking the patterns against real people. Update: I’ve been asked how I know this is a traditional Scandinavian design. I know this because it’s the style of apron my Swedish grandmother used to wear. This Swedish blogger makes that style now and calls them retro. I used a pattern for this one. 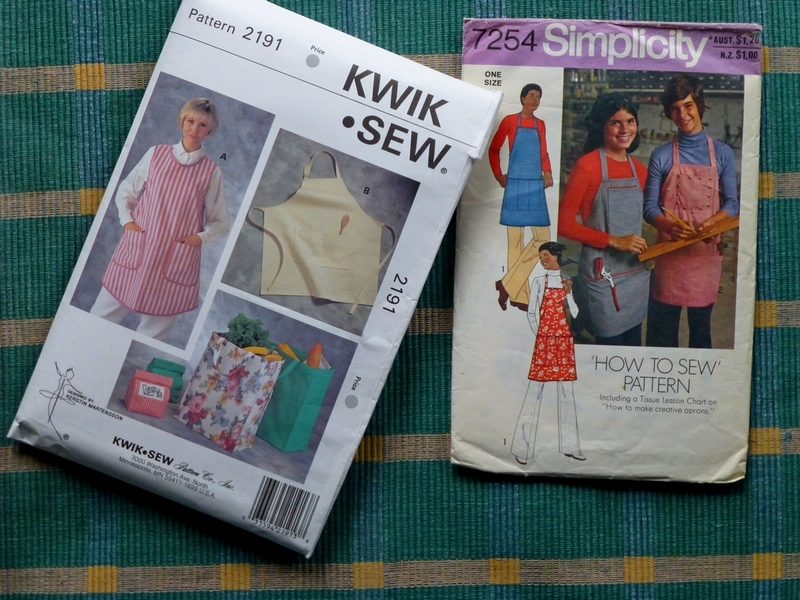 Kwik Sew 2191, which is suspiciously like (meaning having an identical shape to) Simplicity 7254, published in the 1970’s. There’s a great deal of re-use in the pattern industry, it seems to me. 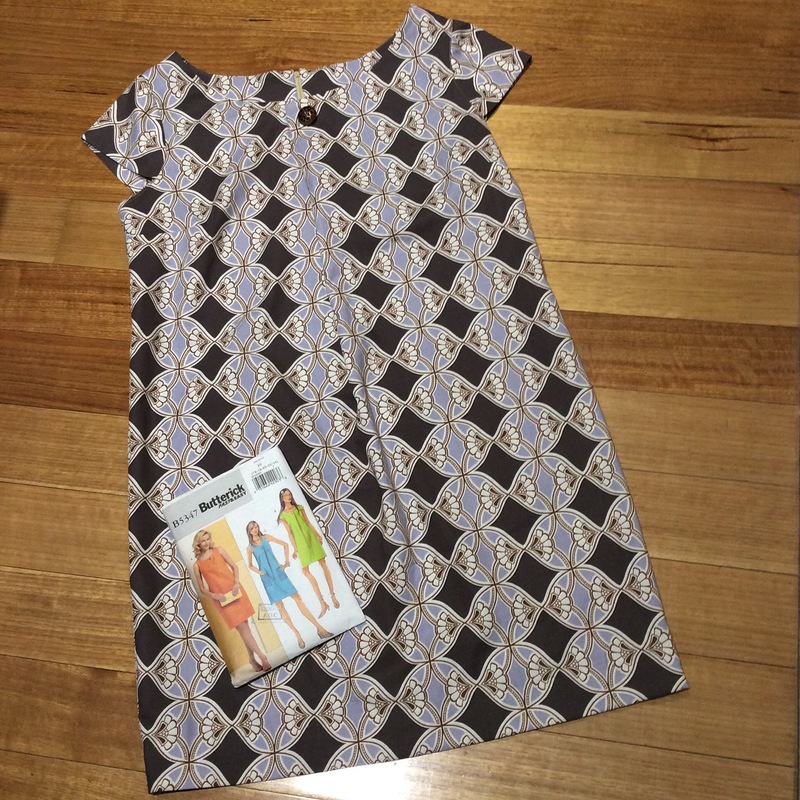 You just reshoot the photos or re-draw the sketches and re-publish the pattern, maybe with different accompanying patterns, and hey presto – more revenue with little marginal cost. I was reasonably faithful to the pattern, but added a zipped pocket to the top so my beloved can keep his mobile phone secure and close to his ears. That could be handy if I need to ask an urgent grocery question while I’m out shopping. We’ve often joked about having a webcam in the pantry to solve those urgent, ‘Can you just check if we have any cumin in the spice box?’ type questions. Need to Check the Pocket Placement before I attach it. Rather than making the ties, I am using braid so that he can do a double wrap and tie the apron around his middle. Talking of middles, I added an inch to the centre of the apron and roughly 3/4 inch to each side. 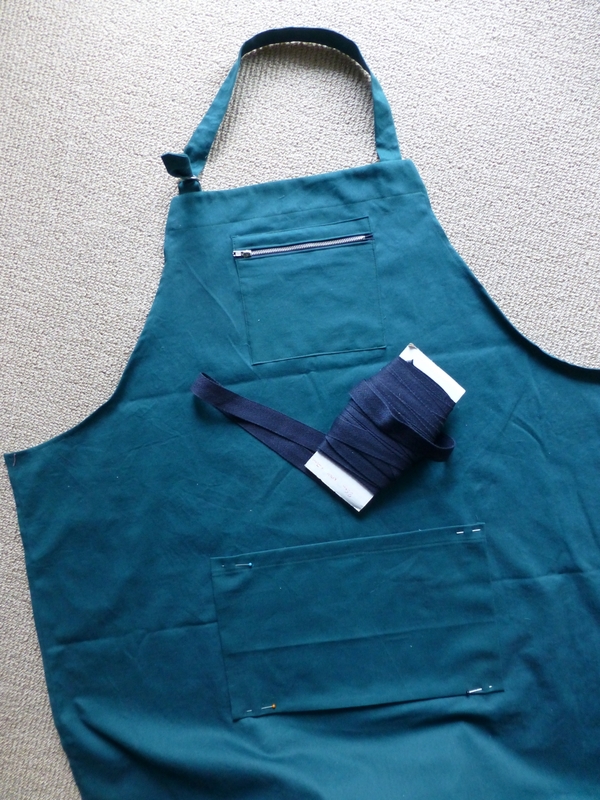 The apron, as designed, is skimpy and skimpy is the last thing a man needs in his workshop attire. Now, let’s see if he wears it because it’s useful, or just to please me. I hope it turns out to be useful. Update 1: My beloved reports it’s a winner! I’m happy about that. Update 2: He has now lodged a feature request – he feels the zipper should covered with fabric so there is no risk of the zipper teeth scratching a finely polished item of furniture that the wearer might be lifting. I’ll make that change next time I make a workshop apron.